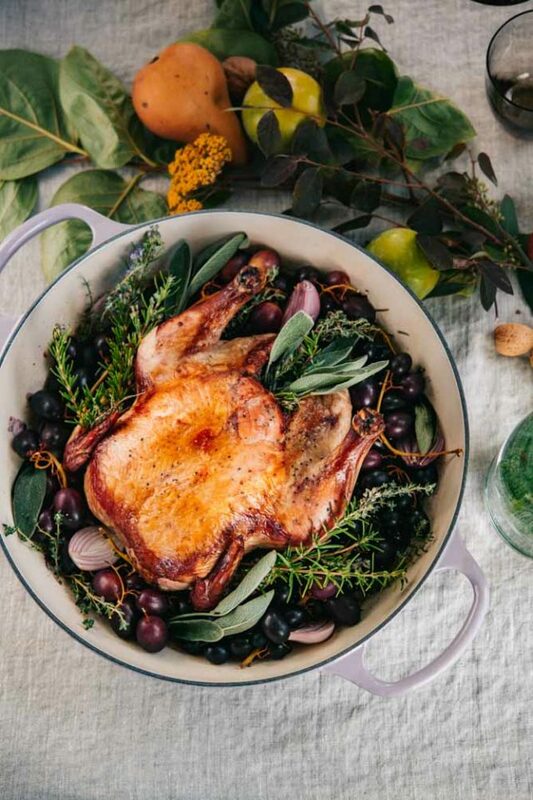 This Red Wine Roast Chicken with Grapes and Herbs is simple to make yet full of flavor. 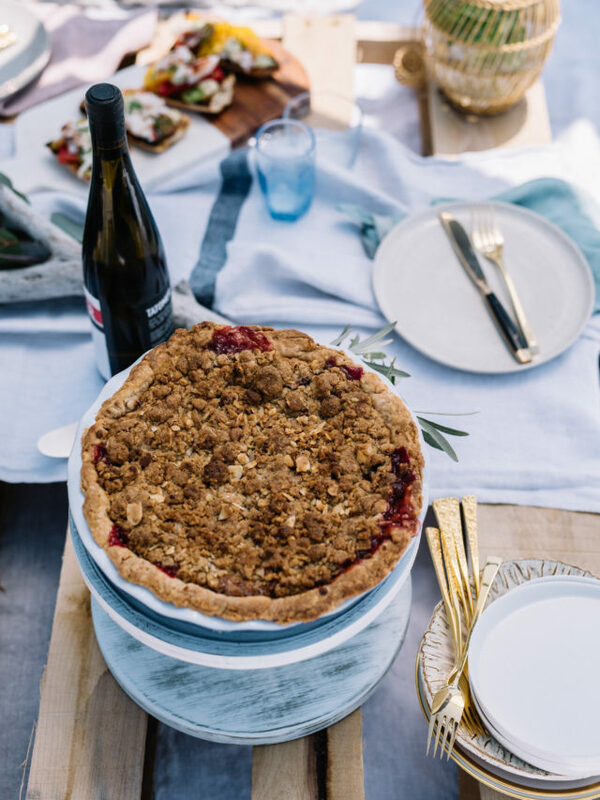 It’s the perfect entrée for your holiday gatherings and showcases some of the season’s best ingredients. 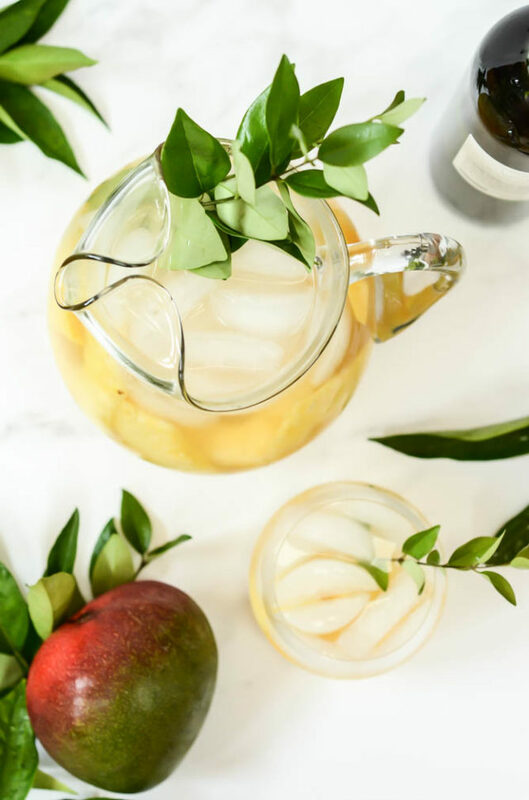 With all of the craziness of the holidays, it’s often easier to get caught up in the hustle and bustle of things than it is to slow down and take time for what this time of year is really about – spending quality time with family and friends. In this season of life where I feel like there are never enough hours in the day, I find myself craving these types of moments more than ever. 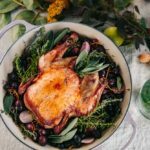 That’s why, when some of my favorite ladies in the food, wine and entertaining industries decided to get together for a Fall Harvest Feast, I quickly agreed to participate – and brought this Red Wine Roast Chicken with Grapes and Herbs as the dinner’s centerpiece. 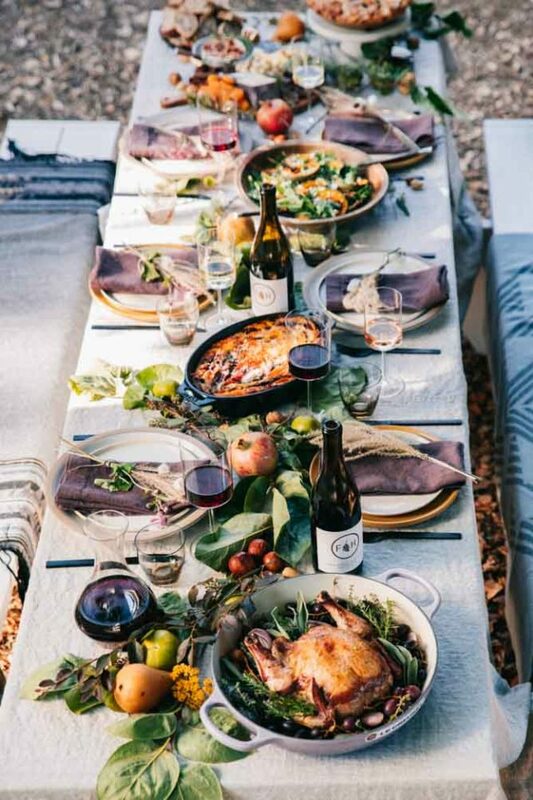 It was almost like Friendsgiving came early and I’m so excited to share all of the details (including this roast chicken recipe!) with you today. I’m going to make a general assumption here, and that assumption is that many of you feel intimidated about roasting large cuts of meat or whole birds. Am I right? I mean, I was once in the same boat. But I’m a firm believer that practice makes perfect and, let me tell you, I have practiced and practiced roasting chicken and – no brag – have pretty much perfected a super simple recipe for you. 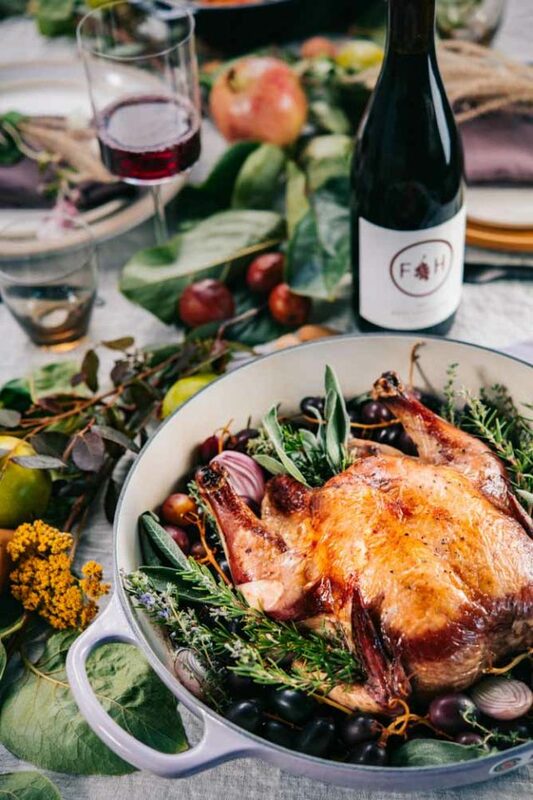 You may remember that a while back I posted a similar recipe – this Champagne Roast Chicken with Grapes and Shallots – as a great show-stopper for any dinner party (or weeknight meal, for that matter.) 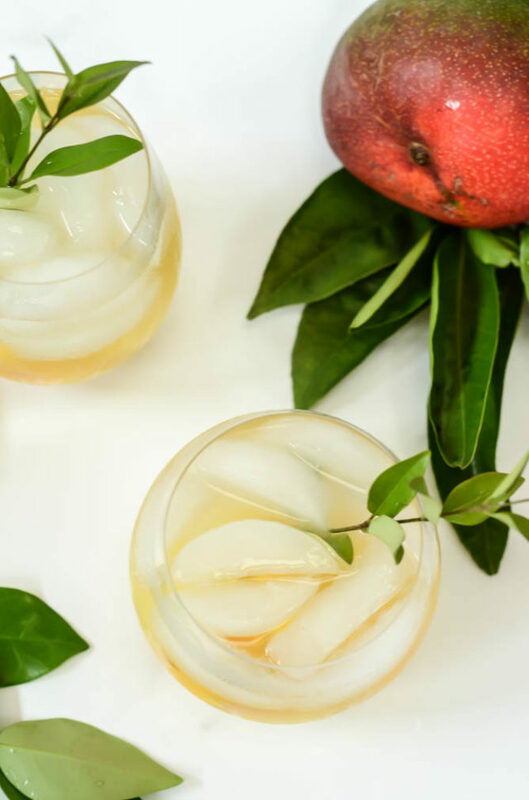 Well, this is ALMOST the same recipe, but with a few autumn-inspired tweaks that make it perfect for any gathering you may be hosting in the next couple of months. And yes, it is so easy. Aside from spending maybe 10 minutes prepping the bird and one flip about 15 minutes into roasting, it’s basically a “set it and forget it” recipe, so you can spend that quality time with all of your loved ones. It also looks quite stunning in its finished form, so if you’re looking for a dinner dish that will add that festive feel to your table, this Red Wine Roast Chicken is it! But enough about my chicken, I want to tell you a little bit about the dinner itself! 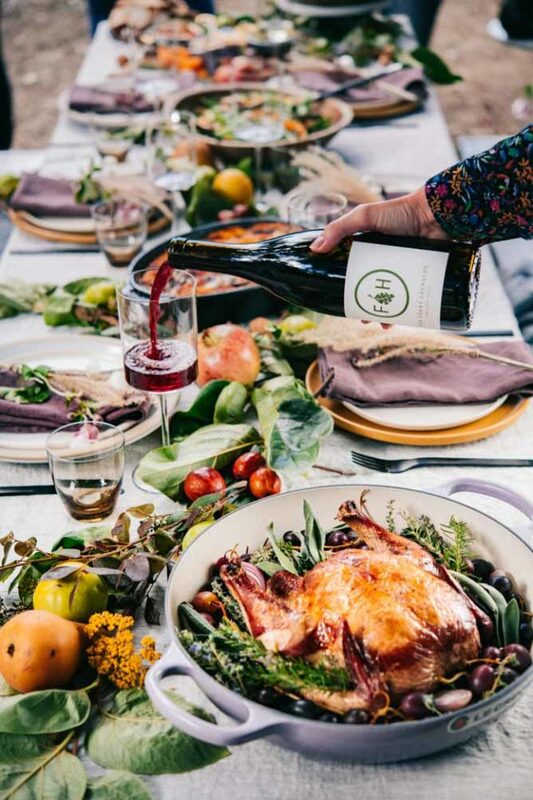 First off, the location and one other very important component of any harvest dinner – the wine! We were lucky enough to go back to the beautiful Folded Hills, a winery and farmstead about 30 minutes up the coast from Santa Barbara. If you want to learn more about them, I wrote an entire post about it here. 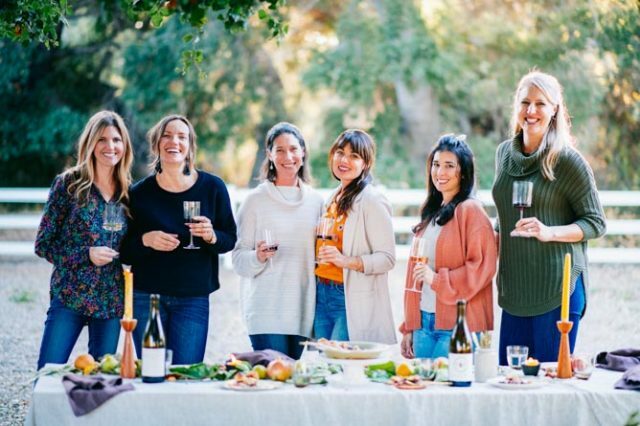 Long story short, if you’re looking for friendly faces, delicious wines, the best chocolate chip cookies and cute little farm critters, be sure to plan a stop here the next time you’re cruising the 101. And then, of course, I can’t leave out all of the other wonderful ladies who contributed their talents to this gorgeous feast. 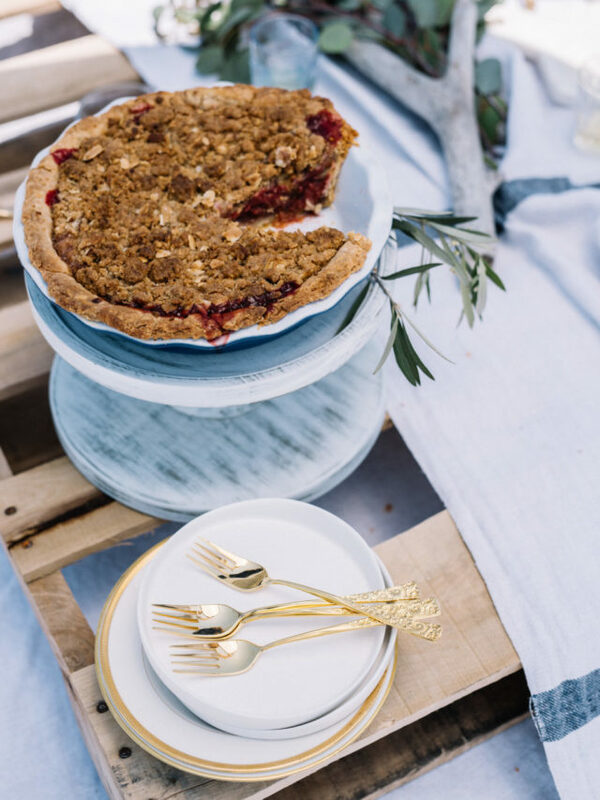 The table was set and styled by the lovely Viktoriya of Fold Santa Barbara, who makes beautiful linens both for retail and special events. 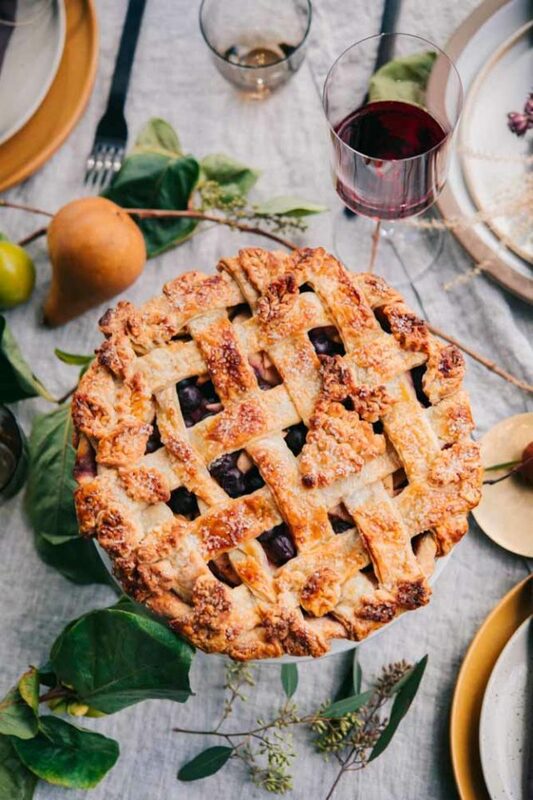 My girl Becky from Baking the Goods contributed a Fall Harvest Grazing Board and the tastiest Spiced Up Grape Apple Pie. 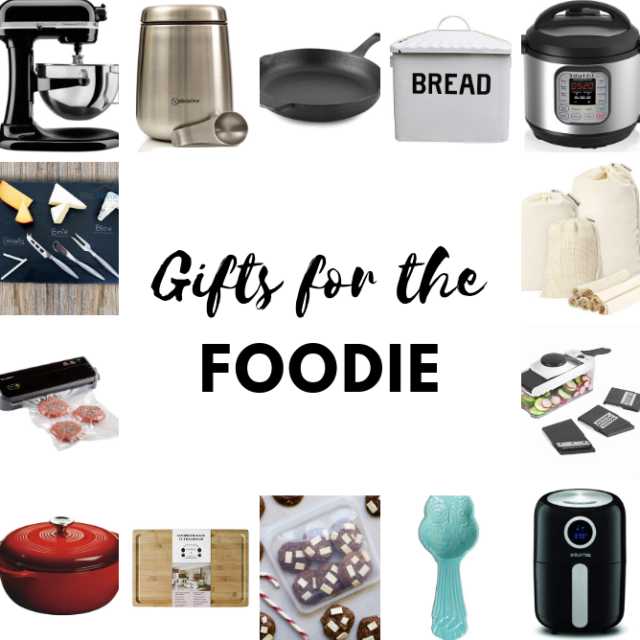 Be sure to check out her blog for some of the best baking recipes around! 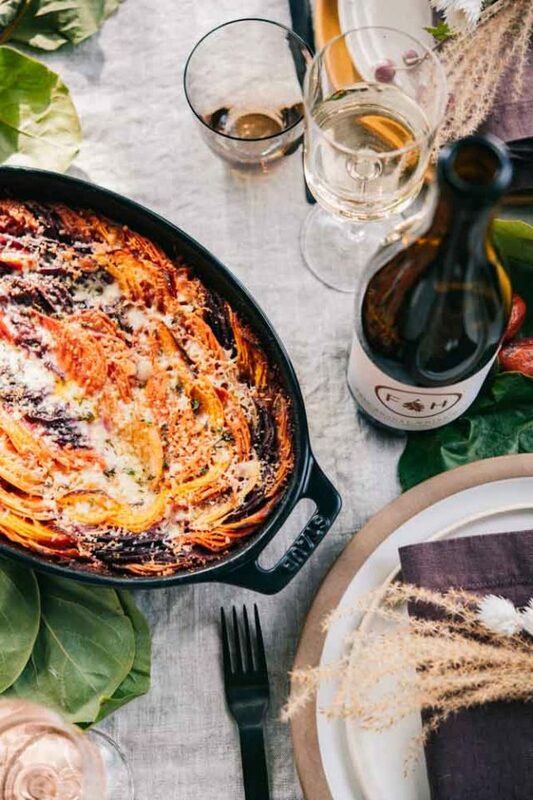 Denisse (aka Le Petit Chef Santa Barbara) added a stunning Root Vegetable Gratin that was absolutely devoured. And can you believe blogging isn’t even her full-time gig? When she’s not blogging (or slinging donuts with her husband), Denisse is a private chef in and around SB. Did I mention she’s also extremely well-versed in vegan and other special diet cooking? 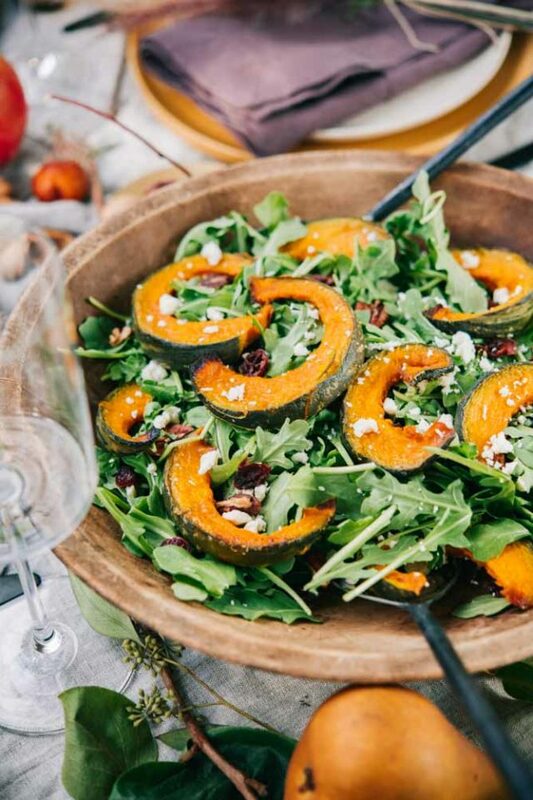 Wine pairings and a mouth-watering Roasted Squash Salad with Warm Cider Vinaigrette were provided by my dear friend Hana-Lee of Wander and Wine. 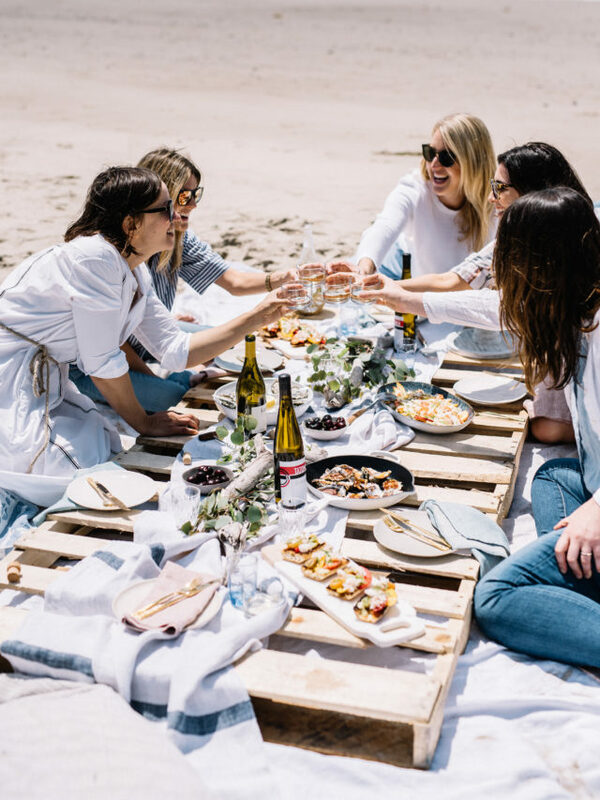 If you’re looking for all things wine- and travel-related, you definitely don’t want to miss out on her blog. Finally, I can’t leave out our very talented photographer, Silas Fallstich (aka Full Frame Fotos). If you live in Santa Barbara (or anywhere nearby), chances are you’ve seen Silas’ work. It’s featured in many of our local publications on a regular basis and we were so grateful to have such talent capturing our lovely day. We have him to thank for all of these gorgeous photos! Sure, we call this “work” – and it is – but it’s days like these that make all of those hours in the kitchen, behind the camera, typing on the computer and with our arms elbow-deep in dirty dishwater completely worth it. If there’s one thing I’ve taken away from this line of work, it’s that every blogger, entrepreneur or creative truly wants to help and support one another. Forget competition, we’re all in this together. And as we inch closer and closer to the ultimate day of gratitude, I have to say I’m so thankful for each and every one of these folks I’ve met along the way and the support structure we’ve built around one another. 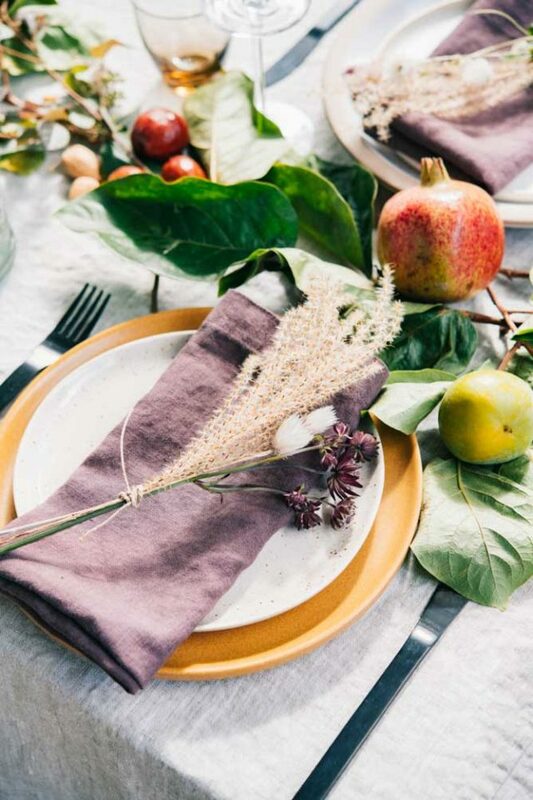 Here’s to a season of gratitude, thoughtfulness, positivity and support! Remove innards from chicken and rinse with cold water. Let drain in a large colander for 2 minutes. Pat chicken dry and place in roasting pan, breast side down. Pour red wine all over and inside the chicken. Season with salt and pepper. Stuff the fresh herbs inside the chicken. Place chicken in oven and turn down heat to 350 degrees Fahrenheit. Roast, uncovered, for 15 minutes. Remove chicken from oven and, using tongs or wooden spoons, flip chicken over so that the breast side is now facing up. Return to oven and continue cooking until a meat thermometer inserted into the thigh reads 160 degrees Fahrenheit. Start checking the temperature after about an hour and a half. For the last 10-15 minutes of cooking, add shallots and grapes to bottom of roasting pan. Once meat thermometer reads 160 degrees Fahrenheit, remove from oven. Transfer grapes and shallots to a serving platter first, and then transfer chicken so it sits in the middle of the grapes and shallots. 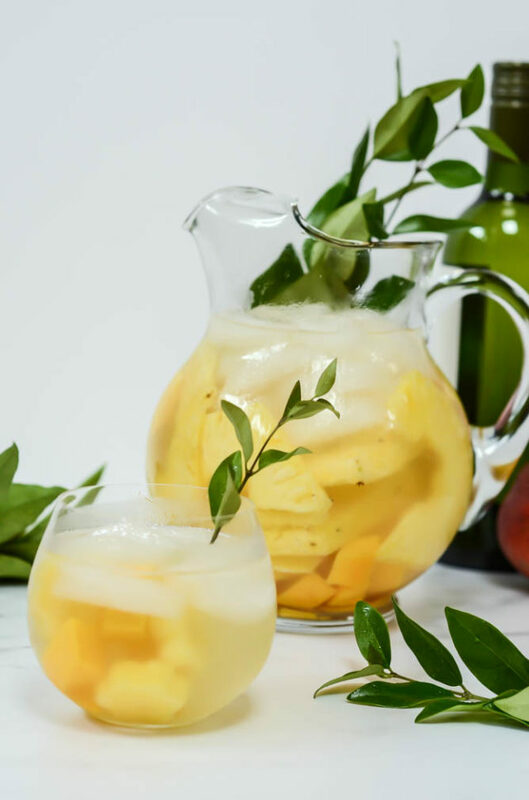 Garnish with additional fresh herbs. 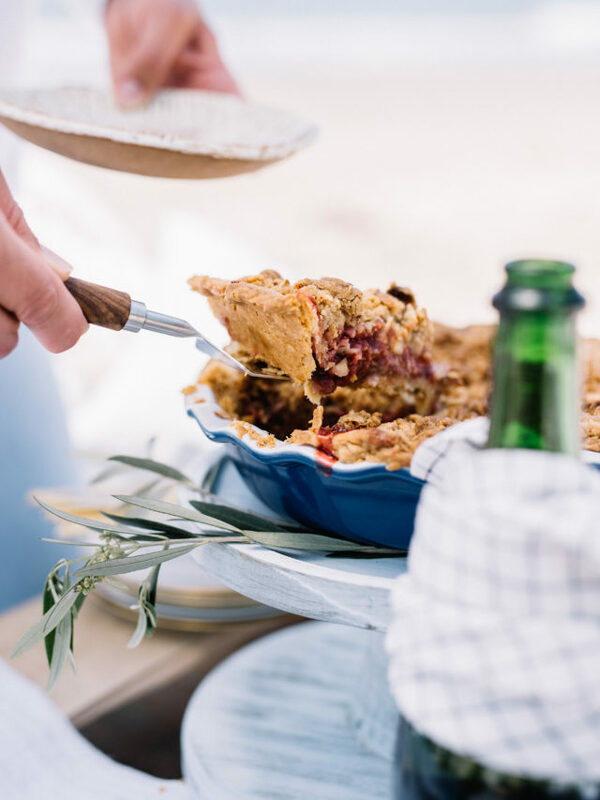 Use a carving fork and knife to serve. 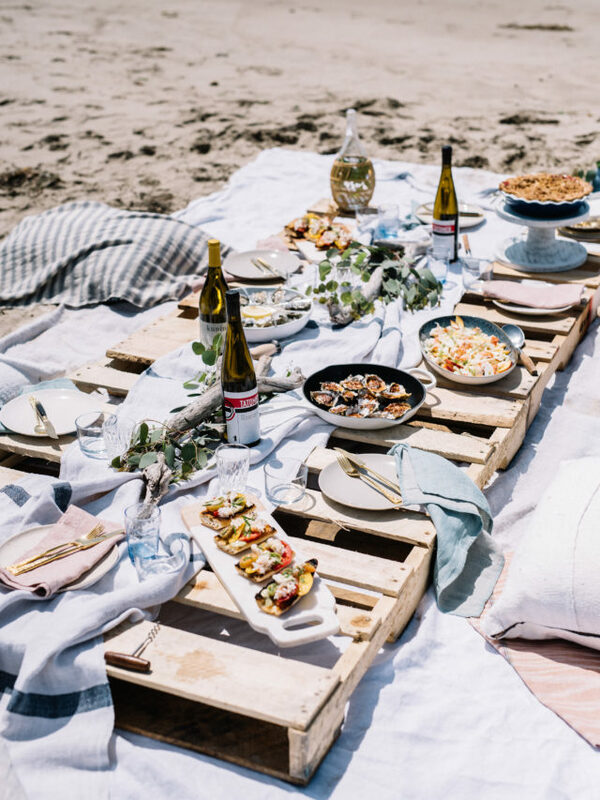 Sauteed leeks and a medley of mushrooms create the perfect appetizer, whether served warm at home for a light dinner or chilled at a casual beach picnic. 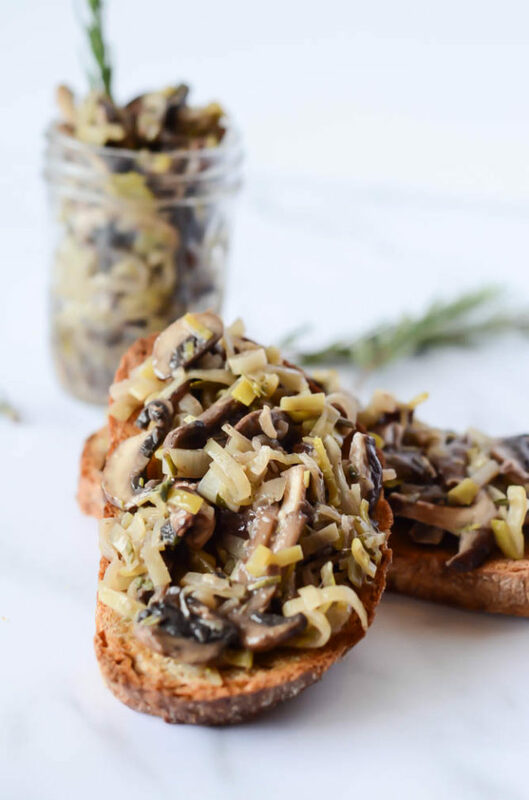 Boy, have I got a delicious treat for you today, and it comes in the form of this Mixed Mushroom and Leek Bruschetta! I sure hope you’re on #teammushroom, because this recipe is chock full of them. If not, you should probably stop reading now and I promise you’ll have better luck with my next post ;-P But seriously, gimme all the mushrooms and nobody will get hurt. 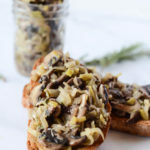 I love those little funghi and I’m getting my fair share of them thanks to this new favorite recipe for topping bread! 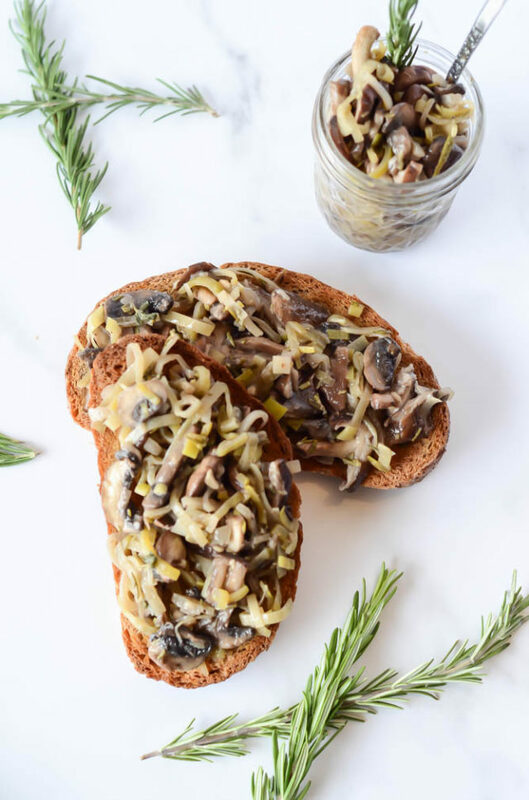 I’ve made something similar before as part of my homemade Bruschetta Bar, but this Mixed Mushroom and Leek Bruschetta climbs to a whole other level with not one or two but THREE different types of mushrooms plus more leeks than you’ll know what to do with (hint: eat them.) It’s healthy yet filling at the same time and, when piled on top of hearty, freshly baked bread (my fave is a darker sourdough or multigrain loaf) it can easily pass as a light meal. Another bonus? 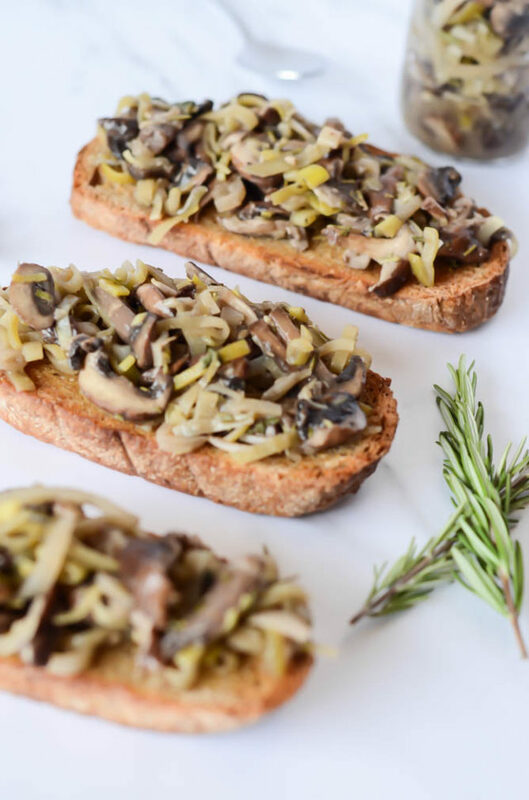 Even though it CAN be served warm, Mixed Mushroom and Leek Bruschetta tastes just as good when served room temperature (or even cold), making it an ideal dish to serve for entertaining or to take with you for a picnic, to the beach, to a potluck, etc. 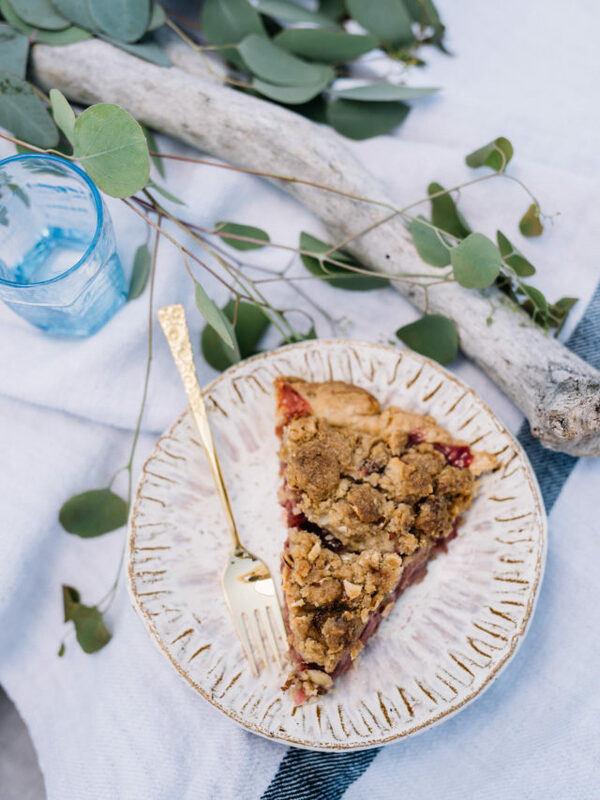 As the mother of a very small child with what seems like no time at all to spend in the kitchen, recipes like these are the ultimate lifesaver right now. In fact, don’t put it past me to make a batch on a Sunday and head to the fridge for it multiple times during the week when I want something healthy and quick. As a certified carb lover, it also makes me feel like I’m working some slightly more nutrient-packed foods into my day-to-day. I’m going to keep it short today because, well, it’s 75 degrees out and there are much better things I could be doing than sitting behind my computer, but I hope you are having a wonderful week! 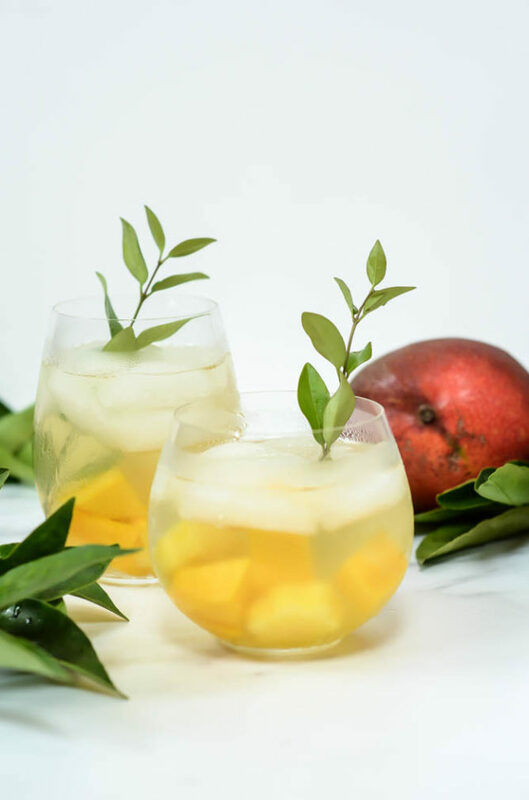 As I’m getting more and more back into regular posts, I’d love to hear what sort of recipes you’d like to see from me. 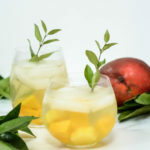 Cocktails? Healthy food? Seasonal fare? Meal prep? Entertaining? Add leek, shallots and garlic and sauté until leek is translucent and fragrant, about 5 minutes. Add mushrooms and stir to combine. Add sherry, vinegar and fresh herbs and cook over medium heat until mushrooms release their juices and have wilted significantly. Season with salt and pepper to taste. Remove mushrooms from heat and let cool. Turn oven on to medium broil and place rack in middle of oven. 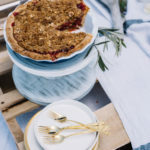 Cover a large baking sheet with parchment paper or a silpat.